WINNER OF THE CMI MANAGEMENT FUTURES BOOK OF THE YEAR AWARD. What if we could improve our ability to predict the future? Everything we do involves forecasts about how the future will unfold. Whether buying a new house or changing job, designing a new product or getting married, our decisions are governed by implicit predictions of how things are likely to turn out. The problem is, we're not very good at it. In a landmark, twenty-year study, Wharton professor Philip Tetlock showed that the average expert was only slightly better at predicting the future than a layperson using random guesswork. Tetlock's latest project - an unprecedented, government-funded forecasting tournament involving over a million individual predictions - has since shown that there are, however, some people with real, demonstrable foresight. These are ordinary people, from former ballroom dancers to retired computer programmers, who have an extraordinary ability to predict the future with a degree of accuracy 60 per cent greater than average. They are superforecasters. 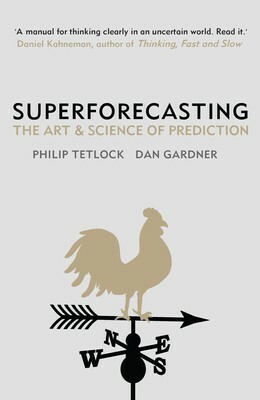 In Superforecasting, Tetlock and his co-author Dan Gardner offer a fascinating insight into what we can learn from this elite group. They show the methods used by these superforecasters which enable them to out perform even professional intelligence analysts with access to classified data. And they offer practical advice on how we can all use these methods for our own benefit - whether in business, in international affairs, or in everyday life.